The most popular post on my blog (based on number of comments and views) is The Best Way to Ripen Peaches. I wrote it because I felt few folks understood how wonderfully peaches ripen off the tree and on their own if treated with a modicum of respect and patience. I think of ripening an avocado and peach very much in the same way: buy them firm and let them do their thing in their own time. So how did I come up with my linen towel technique? Years ago I bought a case of peaches to can and make jam with. The box, chockablock with three layers of peaches, was too big for my dinky refrigerator. I decided to remove the peaches from the box, space them out to ripen on my kitchen window seat, which I lined with linen napkins. To thwart fruit flies, I covered the peaches with a single layer of linen napkins. Each day I’d check for bruised or damaged fruit and dispatch the injured into the blender for a quick trip to smoothie town. By week’s end, I noticed the peaches were sweet and juicy and very flavorful, ripening slowly and deliciously without interference from me. The peaches rested out of direct sun on my shaded window seat seven to ten days, never spoiling, at least the ones not rough-handled during picking, packing or shipping. Forget the jam; I ended up eating the entire case of peaches, reasoning nothing so sweet and juicy should be dropped into a hot water bath. Maybe lesser fruit, but not these room-ripened gems. I’ve been ripening peaches this way ever since. You are so right about riping peaches. It’s exactly how I do it and it works like a charm every time. What I don’t understand is the groceries that don’t bother to put a sign out with a simple explanation on how to ripen a peach. Can you imagine how many more they would sell? Going to get peaches right now to make a crostata! You must have known I was out at Carpinito’s buying unripe peaches as you were making this video. Didn’t think I would have to wait six days to process them, but maybe so. Did you have any peaches from your own tree this year? I had zilch!! Last year three; bumper crop three years ago. What’s going on? You haven’t mentioned your hoop house lately. What have you got going on – in it? Also, HOW DID YOUR TULAMEEN’S DO THIS YEAR? Carol, my peach trees are bare, not one peach. It’s so frustrating that my mini-peach orchard is rendered fruitless by a stream of cold spring rains and no pollinators. I’m ready to plant some in the hoop house, which is coming along – thanks for asking. It’s been a bit of a learning curve and my soil is particularly poor there, so I’m trying to figure out how to approach that. In the meantime, I’m planting in pots and getting ready to sell flowers and ornamentals. My Tulameens were great as always, but I let the weeding get behind and now I have some serious work ahead of me if I want to have berries next year. Well, at least I don’t feel so bad since I know I have company in the fruitless tree department. 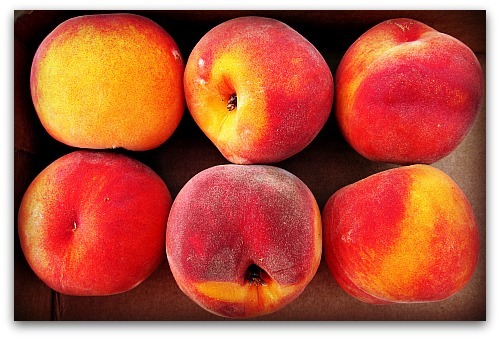 Question – what is your favorite variety canning peach? Last week, I tried some “Sweet Country”; but, I was told they were freestone; NOT TRUE, but good flavor. Yesterday’s fruit run – Roza’s. Never heard of them before now. I fell for the great price but was unable to score a sample of a ripe one. …a gamble for sure. Probably will use them to make peach salsa that’s so good on a pork chop. Hi Carol, Freestone canning peaches, eh? Rozas are good on both counts. Also, I really like Garnet Beauty, and Red Globe is good too. Elberta is a mainstay, as is J.H. Hale peach. Good luck! Maybe so, but spacing them evenly on a cloth on the table, hidden by another cloth, keeps their opulence a secret from fruit flies, and allows them to ripen to perfection! Thanks for a GREAT and blissfully simple idea. Sorry Renoir. No bowl. And thank you Jan for a most delightful lesson in art! On the pic, the peaches look like apple. But they’re just as yummy.